In most pursuits and especially baseball and personal relationships the concept of advancing from third to first would decidedly not be a good idea, and oxymoronic to boot. But there are settings in which this would be contrarian thinking at worst. The third here is not a base, it is a world. Sure, the more genteel term is developing countries. Transfer of technology has always been seen as a one way street, from the first world to the third. When we seek to improve the lot of the over one billion with no electricity access, our tendency is to solve this in a first world way. This entails massive power plants in excess of a gigawatt with transmission lines everywhere, never mind the up to 40% losses on the way. This reminds me that folks who consider windmills to be visual pollution somehow do not have the same fervor in objecting to high tension lines cutting ugly swaths through forests. Central plants inevitably are fueled by coal or natural gas, and more the former in the developing world. This in turn causes the west to complain that with all due diligence there, the developing world would progressively add to the carbon loading. Two distinct areas could avoid this trap of having to choose between lifting people out of poverty and climate change mitigation. One is distributed renewable power (with an assist from microgrids) and the other is energy efficiency. The two most technologically and economically advanced renewable energy sources are wind and solar. Both of these are inherently distributed in nature. A single windmill of the most modern sort puts out about 1 megawatt. Even smaller units are feasible. An Alaskan village, and here we are talking first world, will need at the most a few of these. On price it is competing with diesel based power, with the diesel transported only once a year (due to short duration of water borne transport) at high cost. The ancillary benefit of fewer emissions are clearly a plus. An Indian or African village may well make do with just one, and smaller at that. A development to watch in this space is vertical axis turbines. They are much more bird friendly and eminently more deployable into interior areas than the large sails which have bridge clearance issues. Solar is by far the best suited technology for the developing world, which by and large tends to be blessed with high incident radiation. Since solar power is generated in DC form, we would be advantaged if we stayed with DC all the way to usage. In a village setting the primary uses are lights, fans and cell phone chargers. With LED’s becoming more ubiquitous, all these devices can be DC operated. The good news is that fans running on DC are between 40 and 75% more efficient than those on AC. The same applies to compressors for refrigeration. The not so good news is that DC operated fans and compressors are not yet mass produced to get the cost down. LED’s are getting there and cell phone chargers are already there. If somehow DC operated devices became the norm, the net effect on energy consumption would be highly material. A key enabler would be microgrids. In this situation this would be a DC grid. Edison famously lost that battle, and appropriately so for long distance transmission. But for a limited scope a DC grid would not suffer any material disadvantages. Importantly, conversion efficiency losses would be avoided. As it stands we convert the solar power from DC to AC, put it on the microgrid, deliver it to the homes and convert back to DC for use in LED’s and chargers. Each of the two steps has high single digit percentage losses, possibly more for older devices. 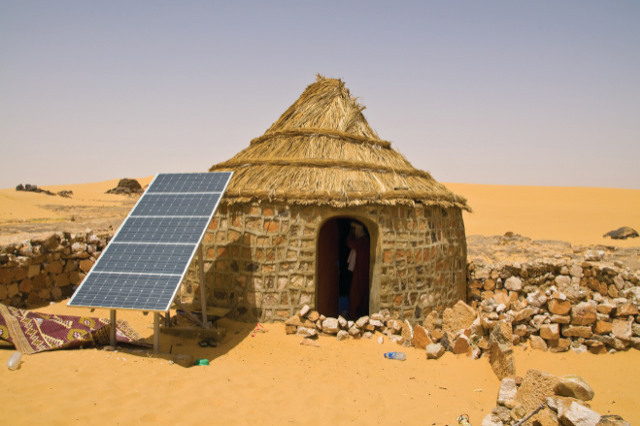 The notional thought is that villages ought to be powered using renewable sources and operate efficient devices. In time this could be the norm, thus reducing the need for large fossil fuel powered plants in developing nations. The ever improving economies of these countries will certainly add to the urban and industrial energy needs. The decarbonizing of these will need separate attention, although energy efficiency would also play here. While inevitably adding to the carbon burden of the earth, these nations could lead the way to a world that uses renewables effectively. The features of the settings of a pressing need and more expensive alternatives will allow widespread deployment. This in turn will bring costs down over time, especially of energy efficient devices such as DC fans and compressors. These advances would now be transferred to the first world, at first in isolated areas such as Alaskan villages and the Australian outback. This is the essence of the premise stated at the outset: advancing from third to first. You are currently reading ADVANCING FROM THIRD TO FIRST at Research Triangle Energy Consortium.